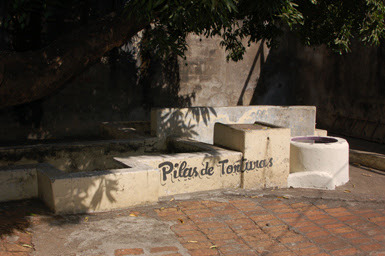 Pools used for water torture preserved in the museum of the Guardia Nacional in Leon, Nicaragua. The Nicaraguan dictatorship that used these facilities was overthrown by a populist revolution in 1979. The U.S. spent the next ten years working to overthrow that revolution. As we contemplate the confirmation process for an Attorney General nominee who cannot bring himself to repudiate U.S. use of torture, it is worth taking a step back and attending to how the world sees torture and the United States' place in the international effort to encourage respect for human rights. The United Nations has an official whose job is to wander the world, visiting prisons and detention centers and issuing reports when mistreatment is alleged. He carries the unwieldy title of "Special Rapporteur on torture and other cruel, inhuman or degrading treatment or punishment." The incumbent rapporteur, Manfred Nowak, is an Austrian human rights lawyer. As he explained to Der Spiegel, being the U.N.'s man on the torture beat is a pretty ghastly job. in the Nigerian city of Lagos, where the United Nations special rapporteur on torture and his team carried out a surprise inspection of a police station that had given itself the rather lofty title of a detention center. "I've never seen anything like it," Nowak says. "Between 100 and 120 severely tortured people crowded closely together. Three women among them, and children too -- the oldest aged 14. Men with untreated gunshot wounds and limbs that were literally rotting -- a common torture method in Nigeria." Ever since former US Secretary of Defense Donald Rumsfeld authorized the use of so-called "enhanced interrogation" techniques in Abu Ghraib, "the United States has lost its moral leadership and authority," Nowak believes. "Today, when the Bush administration criticizes other countries for their human rights abuses, no one takes them seriously anymore." But Europe has not succeeded in taking the place of the United States as the "driving force when it comes to human rights," the lawyer says. On the contrary, he believes the European Union is "seriously tarnished." European governments' cooperation with the CIA in the war on terror and their denial of secret detainee renditions and prison camps has weakened the EU, according to Nowak. On occasion, Nowak has been even more pointed in his criticism of the United State's adoption of torture. This week he released his findings that torture is routine and widespread in Sri Lanka -- and emphasized how U.S. practices lend support to torture regimes. "I am very concerned about the undermining of the absolute prohibition of torture by interrogation methods themselves in Abu Grahib, in Guantanamo Bay and others, but also by rendition and the whole CIA secret places of detention. All that is really undermining the international rule of law in general and human rights but also the prohibition of torture," said Mr Nowak. "(Other countries) say why are you criticising us if the US, the most democratic country with the oldest history of human rights, if they are torturing you should first go there. It has a negative effect because the US is a very powerful and important country and many other countries take the US as a model." I'm afraid the answer to the question Nowak can't answer is that U.S. adoption of torture signals that it should no longer claim to be "democratic country." We can hold all the elections we want, but if the people can't reign in the torturers -- if the people will not or can not lay down a moral and legal line that defines torture as intrinsically unconscionable, criminal -- our "democratic" model is definitively useless and dead. 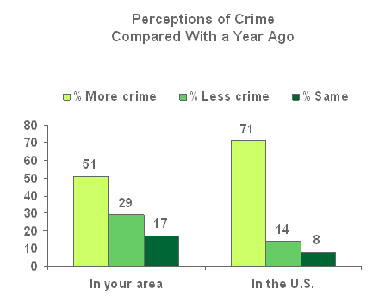 Fully 71 percent of us think crime is rising nationally and slightly over half are sure that it rising locally. 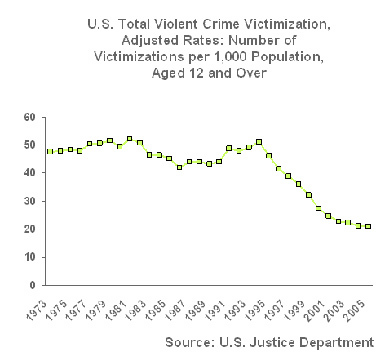 Meanwhile the Department of Justice reports that violent crime has been declining for ten years. Americans' pessimism about crime may reflect an overly negative interpretation on their part of the fact that the decline in crime has tapered off. It could possibly reflect a real increase in media attention to crime on the local and national news. Or it could reflect Americans' broader dissatisfaction with the way things are going in the country, a sentiment that extends from ratings of President Bush and Congress to the economy, as well as to their satisfaction with the direction of the country more generally. I don't think Gallup is doing anything more grounded than indulging in speculation in those suggestions, so I'll offer a few of my own. When CSI and imitators have been the preponderant content of evening entertainment for several years, is it surprising that folks believe there must be criminals under their beds? When local TV news has reduced its content to traffic accidents, fires and murders, perhaps it is to be expected that people think violence is rising. When the mere presence of an immigrant low wage work force is considered a crime by many people, does the growing visibility and ubiquity of immigrants lead to a belief in rising crime? When local media outlets crusade for prosecution of nuisance offenses so as to lock homeless people up out of sight, is it any wonder that people feel surrounded by crime? When young people in poor neighborhoods really do have to fear encountering gun play on the way to school, it's no accident that they and their parents fear rising crime. When the U.S. government invades countries without legal justification, when the Republican party's entire campaign strategy is to hype fear of terrorists, is it any wonder that people think criminality is increasing? We are living a lawless place and time -- and we know it. And we don't like it. Politics is, among other things, an argument about what a law respecting society would look like. Hat tip to Chris Kromm at Facing South for pointing out this survey. 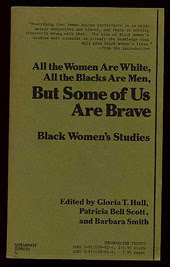 Back in 1970's three visionary African American women, Gloria T. Hull, Patricia Bell Scott, and Barbara Smith, published a ground-breaking anthology titled: All the Women are White, All the Blacks are Men, But Some of Us Are Brave: Black Women's Studies. That title vividly illustrates how people who live inside multiple identities all of which are concurrently struggling for their rightful dignity and place can find themselves erased from all directions. Seeking to endear himself to black evangelicals, Obama has enthusiasticly endorsed of the "inspirational talent" of an "ex-gay" African American gospel singer. Evidently his campaign didn't include any black, gay, Christians though such people certainly exist. 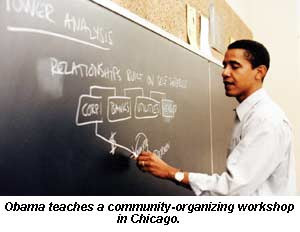 If Obama and his people actually knew such individuals, if they had listened to such individuals, they'd have had a harder time adding up constituencies and trying to buy a sector by offering token representation. Human realities are too complex for such stereotyping -- and nothing pains and infuriates any of us more than having our lived identities thoughtlessly erased. I have no doubt that Obama is not personally homophobic, whatever than means. But his campaign practices a mechanical adding and subtracting of identity constituencies that is certainly not any kind of "new, post-partisan politics." And in this instance, the politics of the campaign were homophobic, especially toward black, Christian LGBT people. And on an old politics note (courtesy of Pam Spaulding), what were Obama's people thinking when they headlined a performer who hailed Bush at the 2004 Republican convention? No, Obama is not brave. The recent South Carolina fiasco can more accurately be called "stupid." On October 19, Sutter Health/California Pacific Medical Center (CPMC) announced it would shut down in-patient care at St. Luke's Hospital in the Mission district of San Francisco. At a city Supervisor's hearing last Thursday, the profitable hospital corporation was the object of withering criticism from doctors, community members and elected officials. Supervisor Tom Ammiano delivered a [sharp] rebuke, accusing hospital officials of dispensing snake oil and failing to provide adequate charity care to the poor and uninsured. Planning and Development showing that the effect of closing St. Luke's would be, quite simply, getting CPMC out of the business of caring for Black and Brown people. 40 percent of in-patient hospital discharges at St. Luke's are Hispanic patients - compared to just 1 percent of CPMC discharges. 54 percent of emergency room visits at St. Luke's are Hispanic or African-American patients - compared to just 8 percent of ER visits at CPMC. Not too surprisingly, the data CNA presents also show that, in comparison to CPMC's facilities in the north and west of the city, St. Luke's patients are far more likely to be on Medi-Cal than private insurance plans and far more likely to live in the Mission and adjoining Bayview districts. 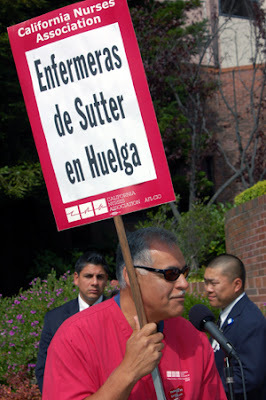 Sutter/CPMC is trying to dump its money-losing poor Black and Brown patients. How much longer will we tolerate profiteering in "healthcare"? ...at today's peace march in San Francisco. 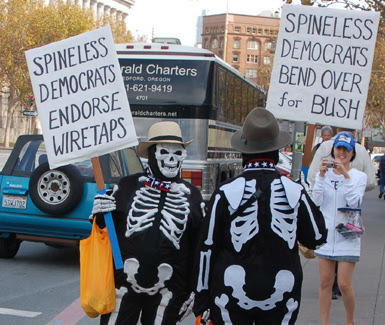 Immunity for the telecommunications companies was not popular with the antiwar crowd. Neither were spineless, Bush-enabling Democrats. My neighbors are being forced out of their home of the last twenty years. Theirs is a commonplace San Francisco situation. The building is old; the former owner was ancient (really, over 100); the tenants never asked for any upgrades or even repairs; and their rents, stabilized by inertia and legal limits on increases, gradually fell way below what the market would bear. When the landlady died, the heirs looked at this piece of San Francisco property and said to themselves "goldmine -- but only if we can get rid of the tenants." The tenants have some legal protections, but over the next year or so, through tortuous legal processes that may eventually lead to cash payments, they are going to be booted out. So how did one of the tenants respond to the prospect of losing her home? 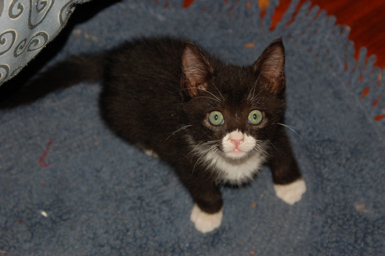 She became a "foster parent" to homeless kittens. 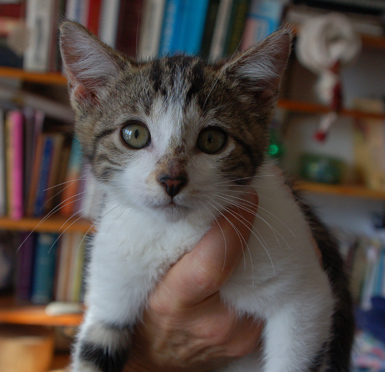 Her task is to spend six weeks loving and handling the offspring of feral cats for Animal Control so that the kittens become ready for adoption. How about these charmers? Not the worst companions when faced with the loss of your home. 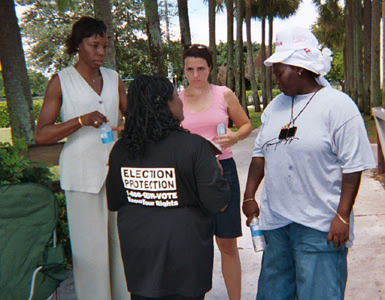 Volunteers in Florida during the 2004 election. paid volunteerism. The phrase may sound oxymoronic, but an ever-growing number of retirees and nonprofit executives say it is an apt description of the way modern retirees view nonprofit work. And while no one has gathered statistics on the tendency, experts say there is a good chance that the automatic link between doing good and working for nothing has been permanently severed. A lot of reporter Claudia H. Deutsch's observations seem astute and worth sharing. "Even a small check is a symbol that what they are doing really makes a difference," said Ben Rosen, a management professor at the University of North Carolina's Kenan-Flagler Business School. Mr. Freedman thinks that is particularly true of women. "Volunteer work used to be considered women's work, so it is not surprising that career women reject the concept," he said. Greg O'Neill, director of the National Academy on an Aging Society, suggests yet another reason: paid workers are less likely to be assigned to licking stamps or ladling soup. "Savvy people have learned that they are used more intelligently when they are paid." Many retirees have learned, to their irritation, that what they give free is discounted as fluff. Ten years ago, Fabianne Wolff Gershon, now a retired public relations executive, did a pro bono marketing plan for a local botanical garden. It was never carried out. 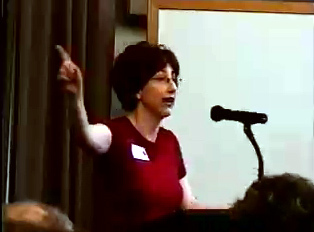 "I made a mental note: If they had paid for the report, they would have taken it seriously," Ms. Gershon said. There is, of course, a potential downside to the trend. Once payment becomes the norm, fewer people are likely to volunteer their services free — which could be a problem in a budget crisis. ...[And] "attaching payment to a job turns it into work." Deutsch is writing, largely, about retired, economically comfortable, older "volunteers". These folks are no dummies. Something similar goes on in "youth leadership development." To be sure about this, yesterday I checked with a friend whose nonprofit organizes young people to do political advocacy; he reports, yes, foundations, are willing and consider it customary to fund stipends for participants in youth programs. (My friend would want me to mention this practice is not universal; his group works with scores of young "leaders" who are unpaid.) So the "link between doing good and working for nothing" is under strain there too. What does this trend mean for political campaigns? A great deal I think. Democracy depends on citizen participation, but media and professional campaign consultants treat campaigns as spectator sports. Not surprisingly, so do most citizens. In many circumstances, recruiting campaign volunteers can feel like pulling teeth. Once we get them, we need to make sure we treat them respectfully and enable them to feel their work was useful. And then the money issue comes in. You've been out talking with voters for a couple of weeks. Your members are learning to doorknock effectively about your election issues. Suddenly "Canvass/Victory in 2008" is offering $200 a day to your members to canvas for them. Not surprisingly, many of your members who need the money want to go get paid instead of working on your organization's canvass. What do you do? To be honest, groups don't usually come up with very creative responses to this hypothetical situation. There aren't a lot. And yet historically political activity that changes the national trajectory has come down to people acting out of some combination of passionate belief and personal necessity. Votes for women, racial equality under law, gay rights -- these things were not won by paid volunteers and campaign consultants. Not only won't the revolution be televised -- it won't pay most of its activists either. In our consumer society, we need to cultivate an understanding that the most vital social activities are those we do "for nothing," for preservation and extension of the hope for community. Juries fascinate me. I'm frequently -- yearly -- called for jury duty and remain certain I'll never be seated. But even my short exposure to a succession of jury examinations has convinced me that there is something about the experience that can, sometimes, bring out the best in us as citizens. I've told the story of one such episode here. On Monday, a federal jury in Dallas reported out numerous acquittals and several failures to reach a verdict in the trial of the Holy Land Foundation and its executives on various charges of funding terrorism. The Texas-based Muslim foundation had been under federal investigation for many years -- some of the charges dated back to before the Palestinian Hamas movement that allegedly benefited from the charithad even been declared a terrorist organization. None of the charges suggested Holy Land's contributions paid for guns and bombs; they paid for clinics and schools, but that propped up "terrorism." For a few moments in the courtroom, it seemed that the jurors had resoundingly rejected the government's theory of guilt -- and then some jurors protested that they hadn't voted as they indicated on the signed jury statement. The judge declared a mistrial and the feds say they'll try again. So what came out of this bizarre trial and its aftermath? There are a lot of different points of view. I've compiled some here. Dennis Lormel, who created the FBI's Terrorist Financing Operations Section and is now a terrorism consultant, said the collapse of the trial is a blow, but far from a death knell for similar cases. "Obviously, it's a disappointment," he said. "But this should have no effect on the overall war on terror or terrorism financing. Regardless of the guilt or innocence, that charity was used to provide Hamas with funding. The government already won in this case, in that this charity's assets were frozen and that kept them from sending more money. 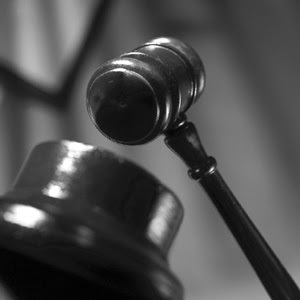 At trial, your standard is different, and they didn't prove it beyond a reasonable doubt." ... Counterterrorism expert Fred Burton, vice president for counterterrorism and corporate security at Austin-based Stratfor, a private intelligence firm, said it's best to view the prosecution as part of a disruption strategy. The verdict didn't come out as hoped, but "you have in essence tied this organization up in knots for a long time." The decision is "a stunning setback for the government, there's no other way of looking at it," said Matthew D. Orwig, a partner at Sonnenschein Nath & Rosenthal here who was, until recently, United States attorney for the Eastern District of Texas. "This is a message, a two-by-four in the middle of the forehead," said Mr. Orwig, who was appointed by President Bush and served on the United States attorney general's advisory subcommittee on terrorism and national security. "If this doesn't get their attention, they are just in complete denial," he said of Justice Department officials, who he said might not have recognized how difficult such cases are to prosecute. Studies by the NYU center over the six years to September 2007 found that of 619 defendants in federal cases potentially involving terrorism, 196 were indicted on actual terrorism charges. Of the 196 terrorism defendants, 62 have been convicted, according to NYU center figures. Only one case, the conviction last year of Pakistani immigrant Shahawar Martin Siraj for planning to bomb a New York subway station, involved the archetypal terrorism scenario of a suspected clandestine cell seeking to carry out an attack on U.S. soil, the center said. One Holy Land Foundation case juror told The Associated Press, "I thought they were not guilty across the board. Juror William Neal added that the case "was strung together with macaroni noodles. There was so little evidence." He said the government "really used fear" to try to sway the jury. This was a classic case of guilt by association and a political vendetta against American citizens to carry out the agenda of a special interest group -- the Israel lobby. The United States of America, for all of its current and past ignominious trampling on the rights of the weak (whether or not we want to own up to that truth) still has a paradigm of value hidden in our collective memory (or at least in our deepest desires) to look to for guidance. It is a paradigm of equality and liberty that very few of us ever really experience, equality and liberty whose very names were penned by a man who owned slaves; equality and liberty in the name of which our ancestors drove indigenous peoples from their lands; equality and liberty in the name of which, in our lifetime, we insisted that our brothers and sisters of Japanese ancestry be herded up and sent off to desert camps; equality and liberty in the name of which many now hold Muslim Americans and Arab Americans in suspicion and hatred. But they are equality and liberty that are larger than our weakness, equality and liberty that are stronger than our prejudices, equality and liberty that will last longer than our selfishness, our fear, and our pride. We are still growing into the equality and liberty that Mr. Jefferson said we hold to be self-evident (if they are so obvious, why are they so amorphous as to disappear when we need them most?). Mr. Jefferson wrote better than he knew or acted, and we read his words better than we understand or fulfill. But once in awhile, in spite of ourselves, a glimpse of equality and liberty breaks through. It may be in the unsatisfactory verdict of "mistrial." It may appear at a moment when the "system" seems to have broken down. It may be, no, it almost certainly will be, in a situation over which we think control is lost. I'm neither as encouraged as Mr. Knight nor as pessimistic as Mr. Feige at the trial's outcome. But I am reminded that "it's never over til it is over." I don't like YouTube much. I can read faster than I can watch video and I prefer that. But this really is "must see TV." It is a clip from the upcoming film "Meeting Resistance" made by Steve Connors and Molly Bingham. A 16 year-old peace activist in Alabama reminds us why we need to turn out -- again -- to the antiwar mobilizations on Saturday October 27. Ava Lowery is raising cash for her full length documentary about the war in Iraq and the troops who have lived it. She can do this for the tiny sum of $10000 -- drop by and drop her some change if you can. 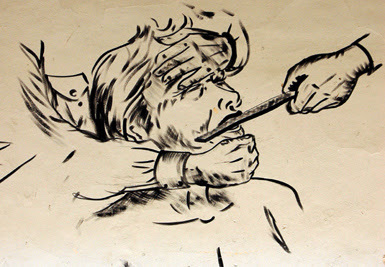 Detail from a mural in Leon, Nicaragua that depicts treatment of prisoners under the U.S.-backed Somoza dictatorship which was overthrown in 1979. Yes, the U.S. has been in the business of supporting torture in some places for a long time. 1. Rendition is something the Bush administration cooked up. Nope. George W. Bush was still struggling to coax oil out of the ground when the United States "rendered to justice" its first suspect from abroad. According to Benjamin, the first instance of the practice took place when Ronald Reagan ordered the abduction of a Lebanese who the U.S. had "convicted" without any known court proceedings of being a hijacker. Benjamin goes on to suggest that perhaps we should look at the Israeli capture of Adolf Eichmann in Argentina as the prototype for rendition. He neglects to mention that the Israelis then gave Eichmann, Hitler's technician of extermination of European Jews, a public trial that documented Eichmann's guilty complicity in massive crimes. Benjamin cannot be arguing that U.S. renditions lead to public legal proceedings. But he does want us to know that Bill Clinton did it too. I believe him on this -- U.S. presidents will keep doing this until we the citizens, and the world, impose the rule of law on our far-flung spooks. 2. People who are "rendered" inevitably end up in a foreign slammer -- or worse. Actually, that's not a foregone conclusion. ...By my count, most renditions since 1995 have involved moving individuals from one foreign country to another -- not grabbing someone in Washington and carting them off to North Africa, as happens to Witherspoon's onscreen husband. ...The CIA has acted as a go-between, arranging the transfers and providing transportation. Usually those being rendered are not brought to the United States because, while the U.S. government may have an abundance of intelligence showing their malfeasance, it doesn't have enough courtroom evidence. No -- rendition is not about bringing someone to trial -- it is about the U.S. government, sometimes on its own and sometimes acting for friendly governments, acting as judge and jury, without evidence that would pass muster in a trial, to lock somebody up, usually outside their own country -- and frequently subjecting them to torture. Mr. Benjamin wonders whether the U.S. still asks the recipient countries "to have some kind of legal process against the suspect" -- not much of a standard. 3. Step one of a rendition involves kidnapping the suspect. The individual may feel as though he's being kidnapped, but that's not usually what's going on. Most of the time, the person is detained by the authorities of the country he is in. They will then hand him off to the CIA, which will fly him to his destination. So I guess he thinks rendition is not kidnapping because someone, somewhere, in some government has decided without any adversarial process that the subject ought to be grabbed up. Sounds like either kidnapping or criminal abduction to me. 4. Rendition is just a euphemism for outsourcing torture. Well, not historically. The guidelines for Clinton-era renditions required that subjects could be sent only to countries where they were not likely to be tortured -- countries that gave assurances to that effect and whose compliance was monitored by the State Department and the intelligence community. It's impossible to be certain that those standards were upheld every time, but serious efforts were made to see that they were. Yeah. And pigs can fly. Such guidelines may had given the officials responsible some plausible deniability in the unlikely event that someone tried to apply the rule of law to them, but the kind of countries that would cooperate with the U.S. in such lawless procedures are the same ones that routinely abuse those they incarcerate. And our spooks knew it and know it - and apparently like the knowledge that someone is doing their dirty work. Yeah, and Jose Padilla, a U.S. citizen had a right be brought before a court and charged with a crime if the government was going to hold him -- didn’t happen, did it? Instead, that U.S. citizen got three and a half years of solitary confinement in a military brig without charge or access to a lawyer and physical and psychological abuse that broke his mind and body. Yes, they finally tried him for phone conversations with a couple of guys who may have had ties to enemies of the U.S. and got a guilty verdict from a jury who had not been told what had been done to Padilla. So much for U.S. citizens' legal protections. Why are apparatchiks like Benjamin so solicitous of the government's "right to render" and and so little concerned with the rule of law that they argue with a movie? Do they perhaps fear that it is still possible to arouse the conscience of the U.S. people against our international lawlessness and its perpetrators? Do they enjoy being unfettered judges and juries for the unfortunate individuals "rendered"? Do they have a lingering fear they might be judged someday? As Bob Dylan once sang: "To live outside the law, you must be honest...." That's hard stuff as Mr. Benjamin demonstrates in his flimsy defense of rendition. Better to have laws and procedures and obey them. San Francisco is having a true snooze of an election. With no real contest for mayor or district attorney, this off year exercise has little to draw anyone to the polls. But the ongoing fight about whose city this is and what kind of place it will be goes on as usual in the propositions. 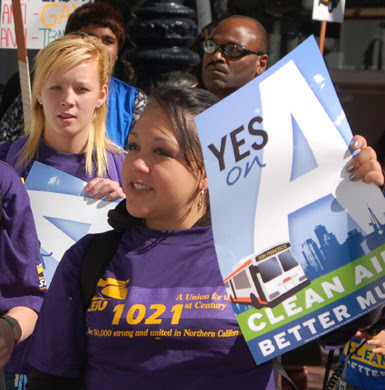 The folks who want San Francisco to be a slightly exotic shopping mall full of financial and commercial headquarters for suburban commuters are facing off against the usual coalition of working class residents, transit users, renters, unions and environmentalists. The turf this time is the contest over Prop. A, our latest attempt to improve the bus system, and Prop. H, a grab bag off developers' wish lists designed make the city more friendly to cars. 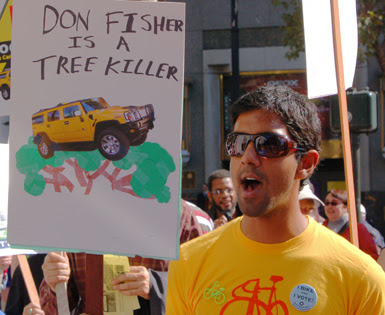 Don Fisher, who owns the Gap clothing retail chain stores and would like to own San Francisco, is paying for Prop. H propaganda. Fisher is the kind of guy who collects art, decides his collection should be preserved by a museum, but wouldn't dream of accepting a wing of an existing institution -- he's going to build his own palace to his taste out in the Presidio (nominally a national park.) A proper contemporary plutocrat, this guy. What does he care whether the buses run on time? Or at all. Proponents of Prop. A held a nice little rally in front of the Gap's downtown store last week. Hope San Franciscans bother to vote. Last spring, ads like the one above were all over bus shelters on the east side of San Francisco. Yesterday, California Pacific Medical Center/Sutter Health announced that the campaign was the sham that many have long feared. 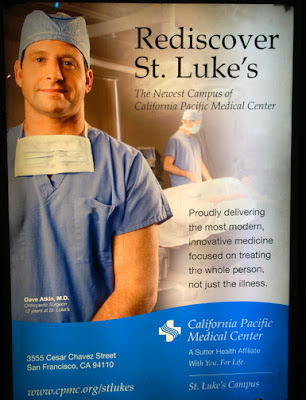 Sutter is pulling the plug on the cash draining business of caring for poor people at St. Luke's Hospital in the Mission. St. Luke's Hospital in San Francisco's Mission District will no longer be an acute-care facility after 2009, but become an outpatient "hub," providing emergency care and services that don't require a hospital stay, according to a plan announced Friday by California Pacific Medical Center. The city knows screwed when it hears it. "This is not the right thing for the health of San Francisco," said Dr. Mitch Katz, head of the city's Public Health Department. Katz argued that the plan leaves one acute-care facility - the public San Francisco General Hospital - in the South of Market region, while it concentrates eight hospitals in the northern, generally more affluent parts of the city. He also didn't think providing the St. Luke's neighborhood with emergency services - but not a hospital to back up that care - made sense. 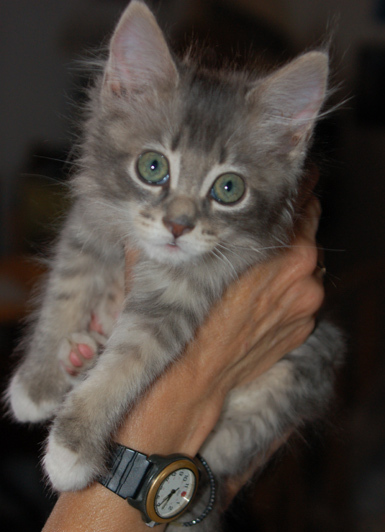 "It isn't optimum care," Katz said. "If you had something serious, would you want to go to a hospital where, if it turned out you had something serious, they couldn't take care of you?" As long as providing life and death services is treated by our society as a license to coin money, people without money will, literally, be treated as unworthy to live. Franciscan Fr. 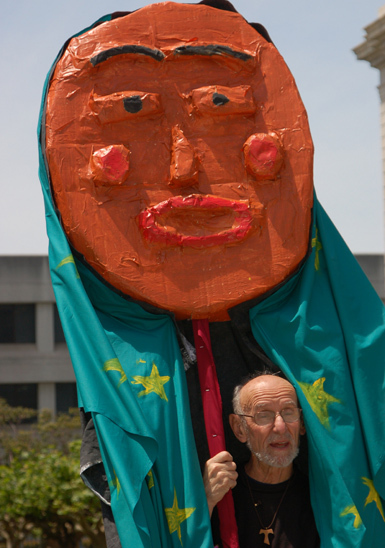 Louis Vitale, pictured here peaking out from under a huge puppet figure bearing the Virgin of Guadalupe's veil of stars, won't be at his usual place at Bay Area peace and justice events for the next five months. Along with Jesuit Father Steve Kelly, Fr. Louis was sentenced Wednesday to prison time for a November 2006 protest at the Army's Fort Huachuca in Arizona. The base is the headquarters of military intelligence in the U.S. and the place where military and civilian interrogators are taught how to extract information from prisoners, according to the two men's lawyer, Bill Quigley. "Our message is that torture has come home to us. We learned from Fort Benning that the U.S. manuals on torture come from Fort Huachuca. The Nazis tortured, Latin American death squads tortured, now we know that we torture people, too. But where does it come from? It comes from Fort Huachuca. That's the headquarters. It's one of the most sinister places on the planet. "We can make a difference. It can be done. ... St. Francis got caught up in a bloody war, and realized that war is not what God created us for. So he came out of it committed to a new world without war. We have to learn from him. We need to address the world's needs with love and compassion, not with war and destruction." Fr. Kelly and Fr. Vitale ask that every woman and man of conscience do all that they can to protest the injustice of torture and to end U.S. policy that sanctions torture. They encourage people to participate in the protests at Ft. Benning, Georgia and Ft. Huachuca, Arizona on November 17 and 18, or consider having a protest in your community. For more information, visit School of the Americas Watch (protest at Ft. Benning) and Southwest Weekend of Witness (protest at Ft. Huachuca). OMG, some of them look like real guns because they are made with the same size and same details accept for being made of plastic and they don’t kill innocents. 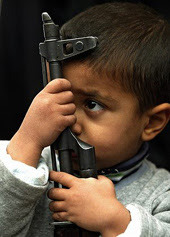 When I saw these kids playing with the fake guns, I felt happy because they at least could have some fun but I felt so sorry because its not the type of fun I wished for them. Several years ago, Nir Rosen made a similar observation about children's games in occupied Iraq in his book In the Belly of the Green Bird. Of course one could see similar children's games in just about any U.S. neighborhood. Do these games mean one thing in occupied Baghdad, another in U.S. inner cities, and something else altogether in a U.S. suburb? Probably. Click on the image above to view an awesome presentation of a necessary but needy campaign. You have a choice of Quicktime or Windows Media and you should go look -- this is simply the best houseparty video I've ever seen. We've always thought of ourselves as the underdogs, so our political strategy was to be really, really, really annoying. But now activists have banded together to overcome the isolation of working in areas where being known as a Democrat can doom your business. They are talking with neighbors, walking precincts, and running for office themselves. They know they are in for the long haul. We need a farm club. In San Joaquin, our politicians haven't done anything to bring people up for the supervisor's seats or the city council ...so now we are hurting for politicians to run for higher office. If you haven't already, watch their video now. And toss them some change via their Act Blue page. H/t to California Progress Report for introducing me to TBRC. It turns out that most people in the United States don't want to jump on the "hate the immigrant" bandwagon. Perhaps the most interesting findings were that, surprise, African Americans were more welcoming to undocumented people than whites. Blacks and whites differed over whether the number of illegal immigrants should be increased, with 14 percent of African-Americans saying it should, versus 3 percent of whites. The races differed more on whether state and local police should turn over illegal immigrants they encounter, even if the immigrants have broken no state or local laws. In such cases, 45 percent of blacks and 61 percent of whites said they believe police should turn over illegal immigrants. Asked whether people who cannot read or write English should be allowed to vote, 54 percent of blacks said they should, versus 43 percent of whites. These findings remind me of discussions during the campaign against California Proposition 187 in 1994 -- Prop. 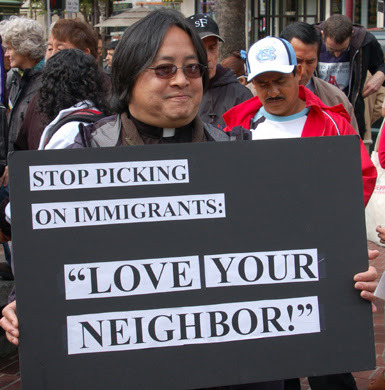 187 was the right's prototype for subsequent anti-immigrant legislation. We, opponents, got hammered as 59 percent of the state's voters passed the measure. But as civil rights advocate Van Jones reminded us over and over: "If only Blacks had been voting, this would not have passed." Yes, the Black community was deeply split, but exit polls showed something like 51 percent against, 49 in favor. Meanwhile nearly 80 percent of anxious California whites approved Prop. 187. With the browning of the electorate nationally, stirring up anti-immigrant sentiment is going to become less and less useful to the right. More and more citizens look at immigrant low wage workers and think "oh, these people are like us; these people are us." Some kind of regularization of status is needed, but most of us are not seeking mass deportations. The Survey and Policy Research Institute (SPRI) at San Jose State University asked Californians what should be done about unauthorized immigrants. A substantial majority of Californians continues to support a path to legal residency for undocumented and illegal immigrants. In October, 59% of California adults (53% of voters) said that undocumented or illegal immigrants living or working here should be allowed to become legal residents of the state, while 30% (36% of voters) disagreed. SPRI has asked the same question about immigration in quarterly surveys since March 2006, and support for residency has remained steady at between 50-63% over that time period. Support for legal residency is strongest among Latinos (78%), liberals (69%), and Democrats (67%), while the idea is less popular among Republicans (44%) and conservatives (48%). What jumps out at me is that this majority who just want our neighbors legalized is not being heard in the immigration debate. How to do we make the majority audible and effectual? Thanks to California Progress Report for pointing to the SPRI poll. It's hard for most people in the United States, even dedicated peace activists, to comprehend the one simple truth: the US is currently losing -- actually has lost -- two wars in Iraq and Afghanistan. We just can't take it in. We've got all the high tech weapons; we're the biggest and meanest giant on the planet; we're the richest society around spending enormous sums on a war-fighting apparatus full of smart, dedicated people -- how can we be losing militarily? It must be a mistake; maybe George W. and Rummy were just incompetent. Gibson goes on to point out that because losing the war to technological inferiors seemed impossible, aside from a few serious military historians, both military and politicians sought to blame civilian authorities for "exercising self-imposed restraint" in killing enough Vietnamese. The Vietnamese might beg to differ. These days, an historians of Vietnam, Gabriel Kolko, is trying once again to explain how the U.S. could be losing wars to technologically inferior enemies in interviews in Der Spiegel here and here. Wars are more determined by socio-economic and political factors than any other, and this was true long before the US attempted to regulate the world's affairs. Political conflicts are not solved by military interventions, and that they are often incapable of being resolved by political or peaceful means does not alter the fact that force is dysfunctional. This is truer today than ever with the spread of weapons technology. 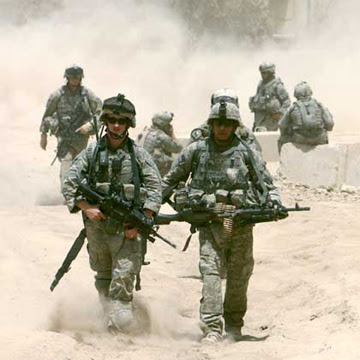 Many in the American military have learned the fundamental dilemma of modern warfare: More money and better weapons don't mean that you win. IEDs, which cost so little to make, are defeating a military which spends billions of dollars per month. IEDS are so adaptable that each new strategy developed by the United States to counter them is answered by the Iraqi insurgents. The Israelis were also never quite able to counter IEDs. One report quotes an Israeli military engineer who said the Israeli answer to IEDs was frequently the use of armored bulldozers to effectively rip away the top 18 inches of pavement and earth where explosive devices might be hidden. This is fantastic, as the cost of winning means destroying roads, which form the basis of a modern economy. Washington refuses to heed this lesson of modern history. Even though our rulers don't get it, it is important that the peace movement understand and proclaim loudly that the wars in Afghanistan and Iraq are well and truly "lost." We owe it to the suffering people of those countries who bear the vast preponderance of the pain. We owe it to U.S. grunts who are getting killed to disguise the loss so that politicians (and generals) now in power can push blame off onto future rulers. We owe it to ourselves, because unless we can ensure a true history of these debacles, we'll just live them again. Knowing that these are lost wars -- wars that no new tactics, or "surges", or even redesigned new armored personnel carriers, are going to "win" -- clarifies that all the arguments about "responsible phased withdrawal" are just hot air. U.S. military forces aren't doing anything in Iraq or Afghanistan but killing and dying -- the meaning of those conflicts is already set. The U.S. launched aggressive wars and lost. Extending the killing and dying won't change a thing, but will increase human misery and U.S. guilt. Blog toy: right brain or left brain? No picture with this one because the picture is the content. The simple exercise at this link claims to show you whether you are right brained (use feeling, "big picture" oriented, imaginative, etc.) or left brained (use logic, detail oriented, facts rule, etc.). I was strongly "right brained" -- until I looked at it for awhile and figured out how to make it give the contrary action. How left brained is that? Try it and share perceptions in comments if so moved. Thanks to Seeing the Forest for this one. The measure of a civilization is the degree of its obedience to the unenforceable. Some twit of a Georgetown University and Brookings Institution foreign policy wonk is so scared of terrorists that he wants to toss away one of the real accomplishments of "western civilization," its condemnation of torture. 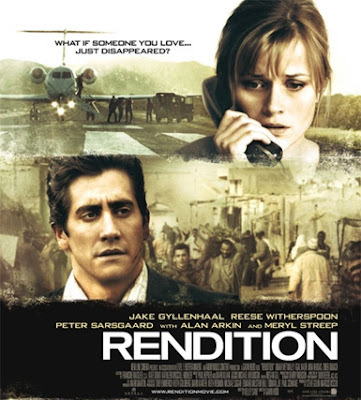 Or perhaps it is not terrorists that have him shitting in his pants, but rather the upcoming movie "Rendition" which apparently exposes the brutality and folly of the U.S. practice of abducting people someone decides are "terrorism suspects" and shipping them off to be tortured by cooperative regimes. Why the movie might just shock the consciences of the sheep -- oops, people. ...dangerous terrorists would go free if the program were abandoned. Basically Byman takes it as a given that the United States should be able to torture at will, but should hedge its actions around with "legal" trappings. To return to Lord Moulton quoted at the outset -- the world cannot, at present, enforce civilized standards on the United States. Our practice of torture places us outside "civilization." It is up to the people of the United States to enforce civilized behavior on our rulers. Or would we rather run hither and thither like scared rabbits? Two friends from different sides of the country, both with deep experience of working in elections, pointed me to this item which partially contradicts what I said about Barack Obama in this post. Am I wrong that Obama doesn't have the megalomanial need to win that a candidate needs? DES MOINES, Iowa — Barack Obama began his speech in an odd and important way, a way that did not make a single news story. Obama was delivering a major address, reminding voters of his early opposition to the Iraq war. It was big deal speech. There were prepared texts handed out to the press and everything. But Obama's first words were not in his text, even though they may have been the most important words he spoke all day. "If you have not yet signed up as a Barack Obama supporter, hopefully after the speech you will," he told the crowd at the Polk County Convention Complex. "Fill out one of those cards. We’ll have volunteers all across the doors. You won’t be able to get out without seeing one of these cards." After Obama’s speech, he worked the rope line, which just about every candidate does. But on the rope line, there was a staff person behind him, with sign-up cards in her hand. And if you shook the candidate’s hand, or got an autograph from him or got him to pose for a picture with you, she handed you a card and asked you to sign up, to volunteer, to bring four friends with you next time. This is an amazing account of a candidate who understands organizing. Maybe the guy does have the burning desire that makes a candidate -- or maybe he is simply the extremely rare candidate who actually understands how elections get won at the base level. For another perspective on Obama as organizer, see this admiring article by Ryan Lizza. This guy was mesmerized by his own publicity too. Looks like the noxious Ann Coulter may have talked herself into an "Army versus McCarthy" moment. 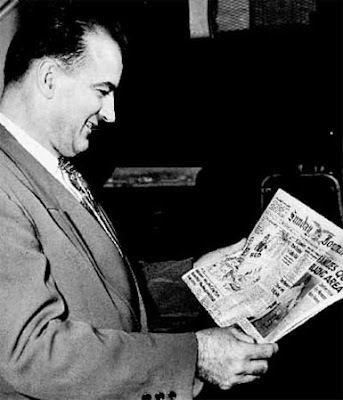 Back in 1954, the Republican Senator from Wisconsin, Joseph McCarthy, had had a good run, stirring up hysteria about phantom communists undermining the country and getting teachers, actors and writers fired for leftist sympathies, real and imagined. But then he claimed the U.S. Army was a hot bed of communism and allowed his aide Roy Cohn to demand preferential treatment for a drafted friend/former lover? Hearings pitting the Army against McCarthy were broadcast on TV and the weight of public and establishment opinion moved to repudiate the drunken inquisitor. Perhaps the best response came from the Anti-Defamation League, which called Coulter's comments "outrageous, offensive and a throwback to the centuries-old teaching of contempt for Jews and Judaism. The notion that Jews are religiously inferior or imperfect because they do not accept Christian beliefs was the basis for 2,000 years of church-based anti-Semitism. While she is entitled to her beliefs, using mainstream media to espouse the idea that Judaism needs to be replaced with Christianity and that each individual Jew is somehow deficient and needs to be "perfected" is rank Christian supersessionism and has been rejected by the Catholic Church and the vast majority of mainstream Christian denominations. Clearly, Ann Coulter needs a wake-up call about the power of words to injure others and fuel hatred. She needs an education, too, about the roots of anti-Semitism." That she does. As the league points out, "supersessionism," the theological notion that Christianity "completes" or "perfects" Judaism is, along with the deicide libel, anti-Semitism's major theological underpinning. For once these folks are confronting real anti-Semitism, not the phony stuff that amounts to questioning the behavior of the state of Israel. Christians do need to be reminded often about the terrible consequences of bad theology. Coulter needs to shut up. UPDATE: Coulter has her rightwing Jewish defenders. In the Jewish Daily Forward, Yaakov Ariel, a professor of religious studies at the University of North Carolina at Chapel Hill, discounts her remarks. May I say, oy vey?